We left this subject in Part 1 with the Victorians elevating their most mundane technological innovations (such as plumbing) through the help of Renaissance and Gothic architecture, and advertizing them with 15th and 18th century picture frames. The Victorians were innovatory in the matter of other public buildings, as well as pumping stations; schools, libraries, railway stations, post offices and hospitals were built on similarly grand and often decorative lines. The Royal London Hospital, originally founded in 1740, had grown to be Britain’s largest general hospital by the 1890s; it was rebuilt between 1896 and 1903, with this magnificent brick and terra cotta sign in the gable. It is a reimagining of a Mannerist ‘leatherwork’ frame, with the stylized curled edges of an animal hide and pendant bunches of flowers suspended by scrolling ribbons from faux nails decorated with bows, as in this example by Karel van Mander, below. 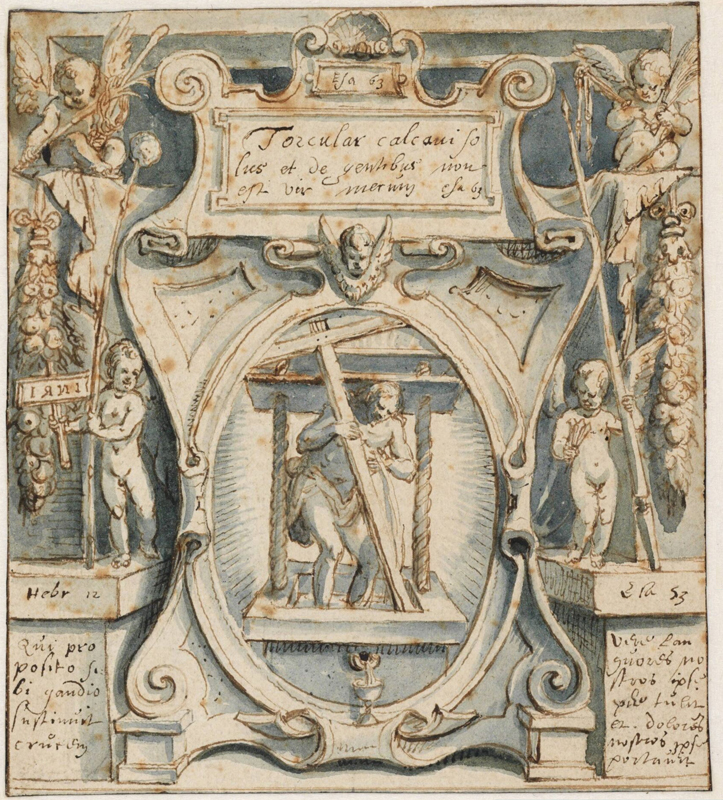 The British Mannerist style of frame owes its form to 16th century carved wooden ‘Sansovino’ designs, as well as to printed cartouches from the 17th century, both of which are interconnected through their ornament and overlapping functions as the frames for portraits and subject pictures. Removed from its sources and employed as the framing cartouche for the sign of the hospital, it gives a majestic and suitably historic air to this 150 year-old foundation. 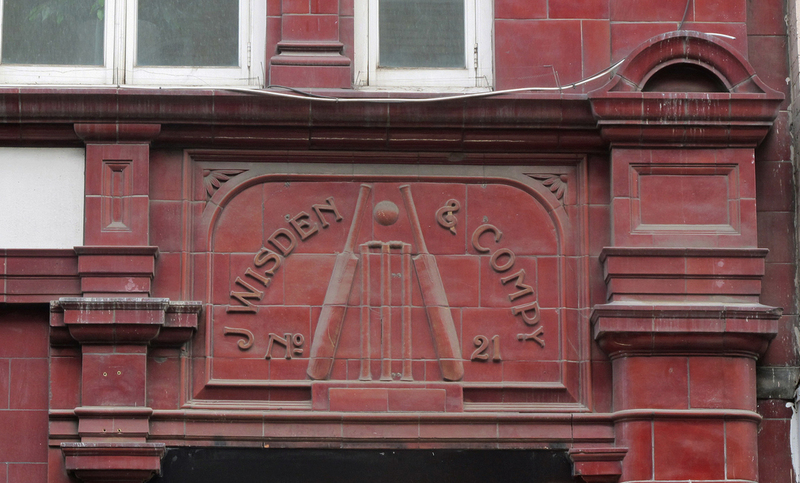 Another commercial enterprise with an architecturally framed logo is J. Wisden & Co., publishers of Wisden’s Cricketers’ Almanack. This firm occupied Transad House, with its offices above Leicester Square tube station, during the early 20th century, having had a shop in Great Newport Street from 1896. The station was redeveloped in the 1930s by Charles Holden, who was responsible for the standard 1930s underground designs, but part of the earlier station building by Leslie Green stills survives, with its Arts & Crafts style and façade covered in glazed ox-blood terra cotta tiles. Apart from the surface finish, the similarity of the Wisden framed logo to an interior overmantel frame can be seen when compared with a chimneypiece in Arts & Crafts style: the blocky, panelled, architectural construction of each could blend in a perfect whole, and an overmantel looking-glass could easily replace those cricket stumps and bats. By this point, poised on the edge of the 20th century, the picture frame was finding other commercial fields opening up for it. As there was a decreasing call for decorative gilded mouldings, and as artists turned progressively to plainer or minimalist styles, further, newer avenues seemed to open for the rejected ornamental giltwood frame. Robert Sielle (1895-1983) was a London framemaker who spanned the extremes, from gilded revival to avant-garde designs. Having moved from serving as a fighter pilot in World War I through a stint as a professional dancer on stage, he went on to found a framemaking workshop in his mid-thirties, working for many of the best-known British artists from the 1930s to the beginning of the 1980s, as well as for for museums and galleries. 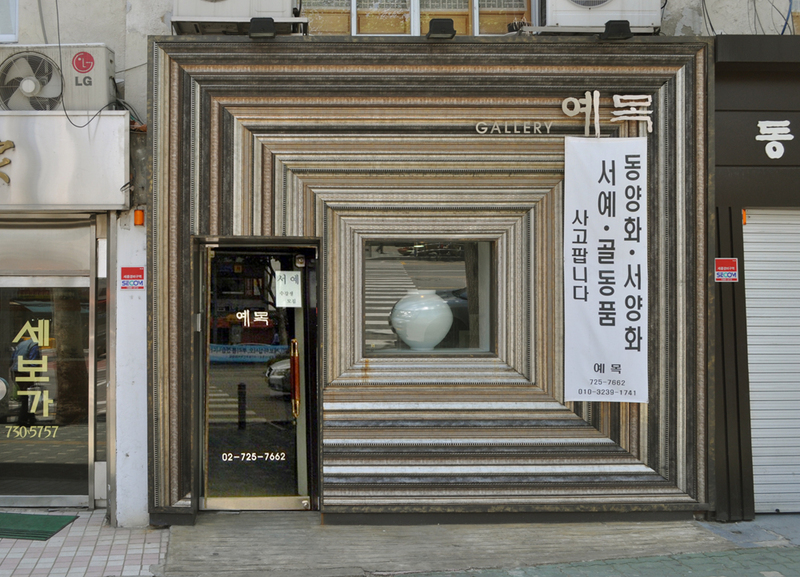 He produced carved and gilded replicas of antique frames, and also created innovatory contemporary styles. His workshop was ruined during the Blitz of World War II, and the financial pressure this caused may have induced him to think laterally of ways to make the space and his products pay. A series of photos of mannequins posed in Sielle’s derelict studio, of which this is one, probably brought him some much-needed income. 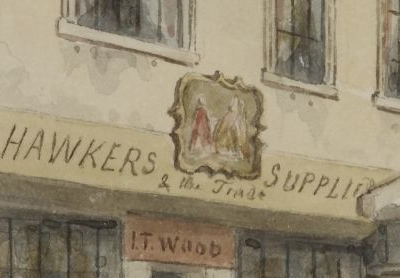 The models, standing inside full-length gilded frames, bring to life the shop sign in Thomas Hosmer Shepherd’s watercolour of Holywell Street. 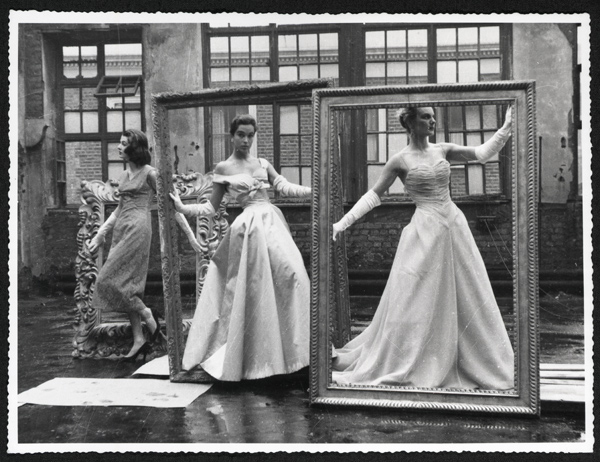 Here frames are once more being used to sell fashion: not now as an idealized vision of second-hand clothes in a grubby lair off the Strand, but as finely-crafted sculptures setting off exquisite ballgowns. This may be one of the earliest incidences of picture frames being used directly to display designer clothes, but it was a combination waiting to happen. The coincidence of 350 years of society portraiture, where women in silks, velvets and jewels posed alluringly in gilded borders, had suddenly revealed its mercantile possibilities. If the Sielle photo is compared with the painting above, it can be seen that the mannequin in the centre is standing inside a replica carved and gilded 17th century English panel frame (so-called because of the low-relief carved panels of floral decoration between plain reposes). The portrait of the Countess of Dorchester from Lely’s studio is framed in the same style, and similarly shows a beautiful young woman in an opulent low-cut gown of silk and lawn. 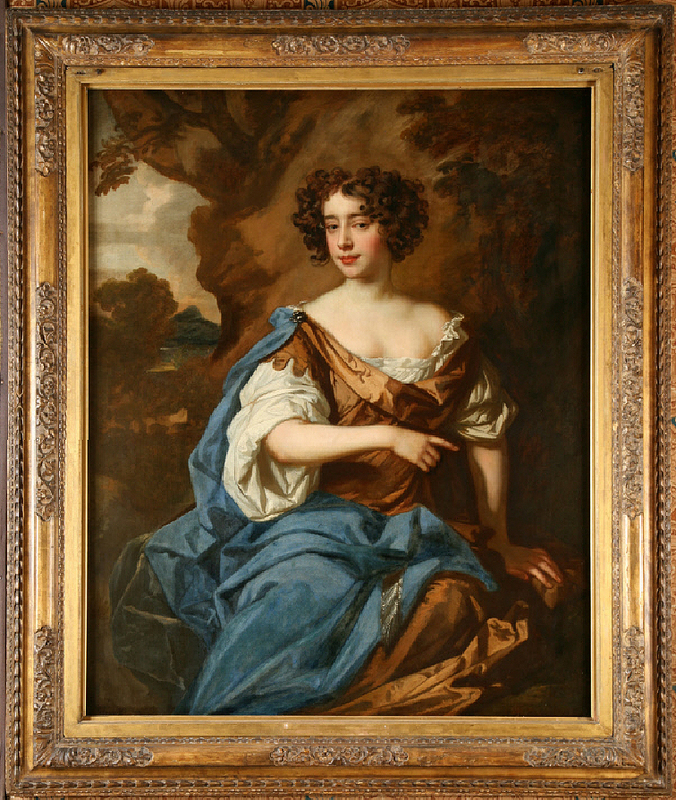 Lely usually clothed his sitters in a sort of timeless pseudo-classical style, presumably in order to prevent them dating, and also to give some rather Jesuitical excuse for the immodestly revealing necklines; apart from this lack of contemporaneity in the Countess’s dress, the effect of both images is very much the same. It must have become strikingly clear that antique frames could imply a wealth of meaning if they were used to present and display fashion: implications of class, luxury, craftsmanship, and even art. Photo by Marcelo Krasilcic for Elle Italia, October 2011. There is a gap of nearly seventy years between the shoot in Sielle’s workshop and a fashion editorial in the October 2011 issue of Elle Italia magazine, but in the latter the photographer Marcelo Krasilcic is essentially recreating the post-war Sielle photos in a contemporary vernacular. 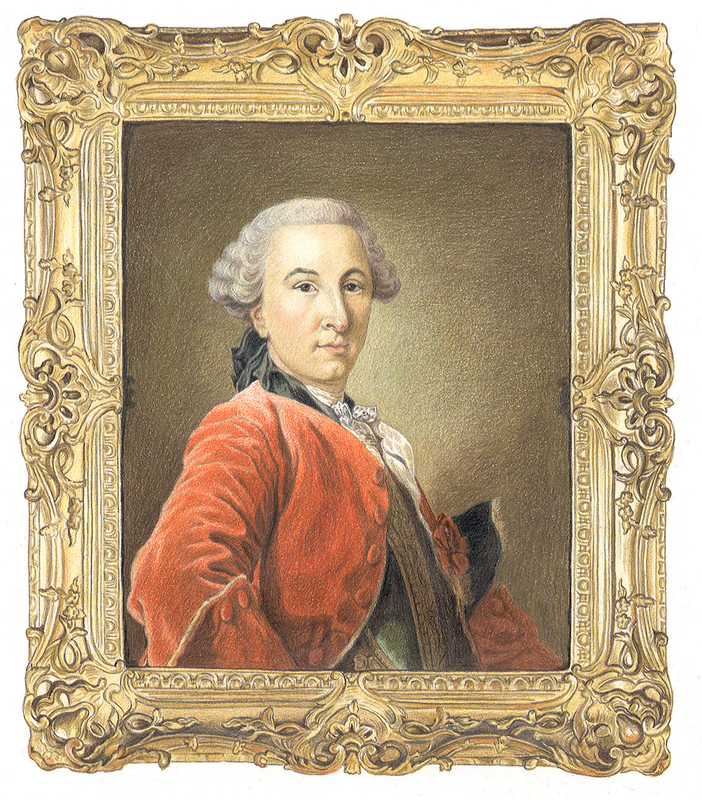 He is also looking back to portraits of men and women clad in the most luxurious and up-to-date contemporary fashions: the gamine model in her masculine jacket, haloed in a gilt Rococo-style frame, harks back to images such as that of the Marquis de Luker in Van Loo’s mid-18th century portrait, similarly shown bust-length, in a tailored jacket and stock, and presented in a swept Rococo frame with rocaille corner-&-centre cartouches. Without these indices of grand-luxe, what would either of them be? – reduced in importance, authority, desirability and cachet; deprived even of the witty tongue-in-cheek awareness of their respective poses which informs both these likenesses. 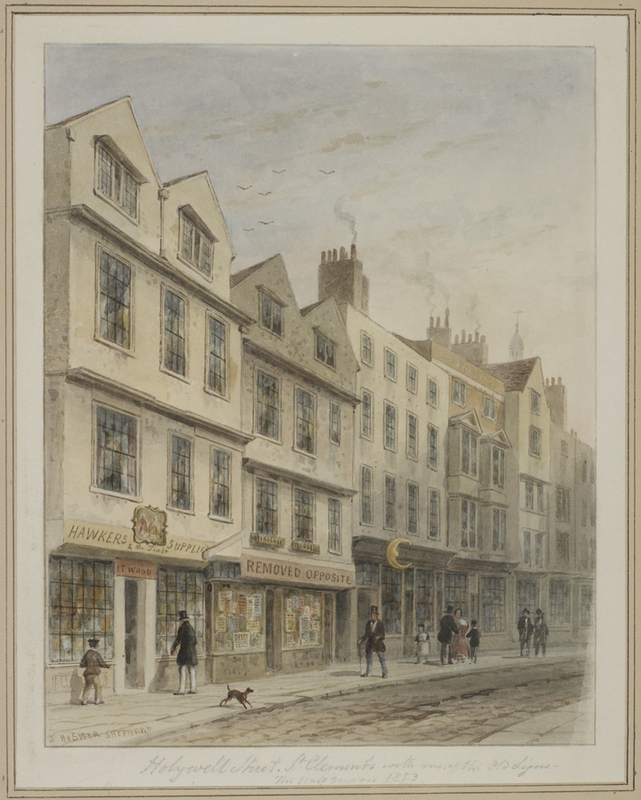 It was a very easy jump for the frame to make, from the presentation of portraiture to the display of the fashion model, and from there it was an even easier step – helped by the previous associations with shop signs and trades cards – to the use of frames in window dressing. 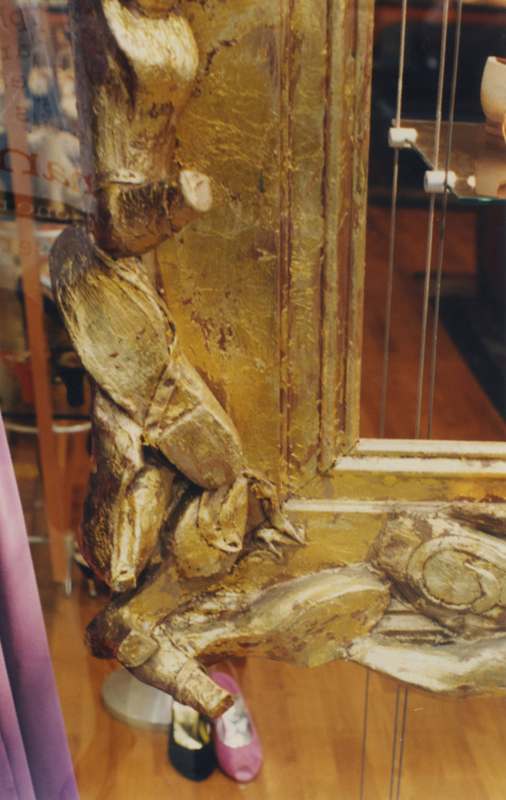 This is the window of the shoe shop Pied à Terre, during the 1990s, and before it moved from Old Bond Street to South Molton Street. Its display consists of what can only be described as trophy frames. Each frame holds a Perspex shelf suspended at the centre, with a single pair of shoes poised upon it, like a portrait of Cinderella’s glass slippers. The shoes which have been mounted around the frame include different styles, as can be seen from the detail – high and medium heels, flats, laced and ribbon tied. The basic frame carcass has been gilded; the shoes seem to have been finished with gold paint. This is an eye-catching and witty take on the trophy frame – which might, at its peak during the 17th to 19th centuries, have included sextants, armillary spheres and cannon on a naval trophy frame; musical instruments and painting equipment on the frame of an accomplished 18th century woman; or military trophies and lions on the frame of a prince’s portrait. No more than a single pair of actual shoes is needed inside each frame, when such a dramatic statement has been shouted to the passers-by. Prada, Christmas window display 2010. Courtesy of Prada. 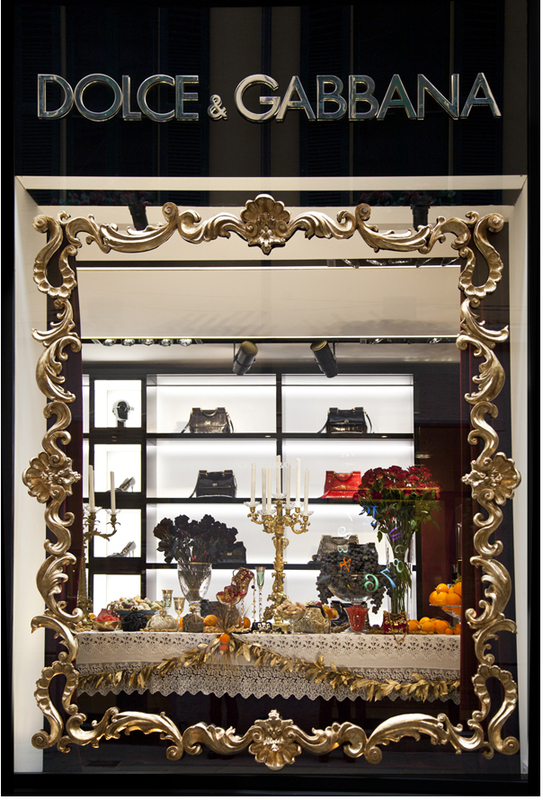 ‘Prada presents a minimal-Baroque window display for Christmas 2010. The installation reinterprets the classic aesthetic of a Florentine picture frame. The frame is divided into many parts and placed on a silk-velvet base in which the richness of the decorative element is integrated with a neutral black background. The mannequins and accessories become the subjects of a futuristic picture that is inspired – in a contemporary way – by still-life compositions and Flemish paintings. This explanation of the arrangement of a shop window as a form of still-life painting, where the composition of a few chosen objects is delimited and focused by a picture frame, develops from the 17th century Dutch work – outwardly a vanitas, but equally a sensuous appreciation of exquisite objects – where items of gold and silver, rare glass, mounted shells and Chinese porcelain hint at the wealth and taste of the owner. It is a display, in the same sense that the buffets of king and courtier would be laden with physical proofs of their status. 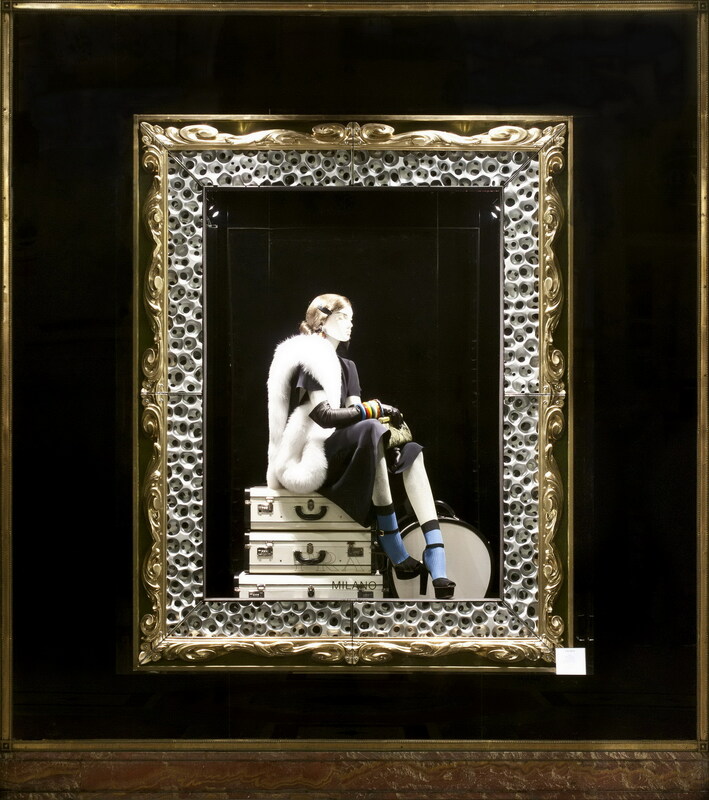 Luxury items are presented in the shop window as an ensemble of desirable objects, and the picture frame both provides the context for this selection, and a memory of the painted contents which might originally have filled it. 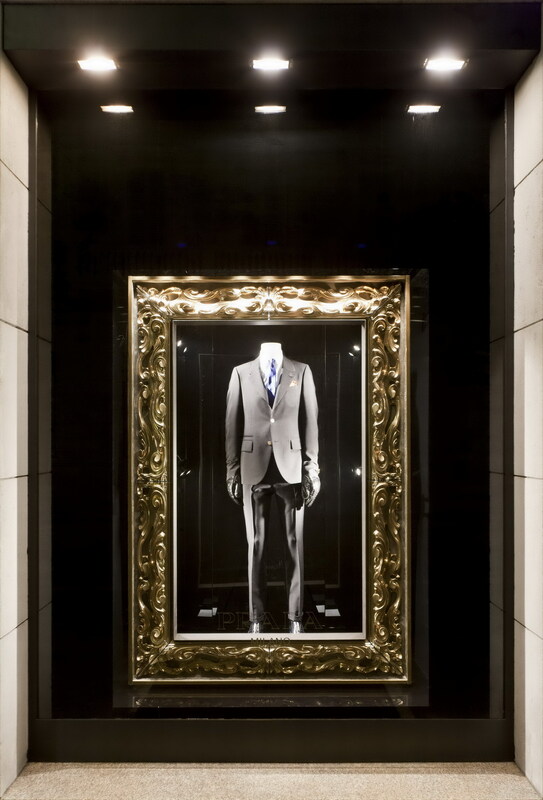 Other styles of frame may be employed, to jog different memories: for example, the Rococo frames used by Dolce & Gabbana in their shop windows for Christmas 2012 encased banquets which recalled the fêtes galantes of Watteau and Lancret. In this scheme, the spectator outside the window becomes the elegant player in the pastoral, who is invited into the composition, to flirt over the fruit and sweetmeats, and play with the objects around them… in this case, luxury handbags, rather than lutes and mandolins. One of the most recent, and startling, instances of the ornamental giltwood frame being used commercially to convey a message about the item being offered popped up on the London Underground (and certainly all other undergrounds and metros worldwide) in August last year (2013). 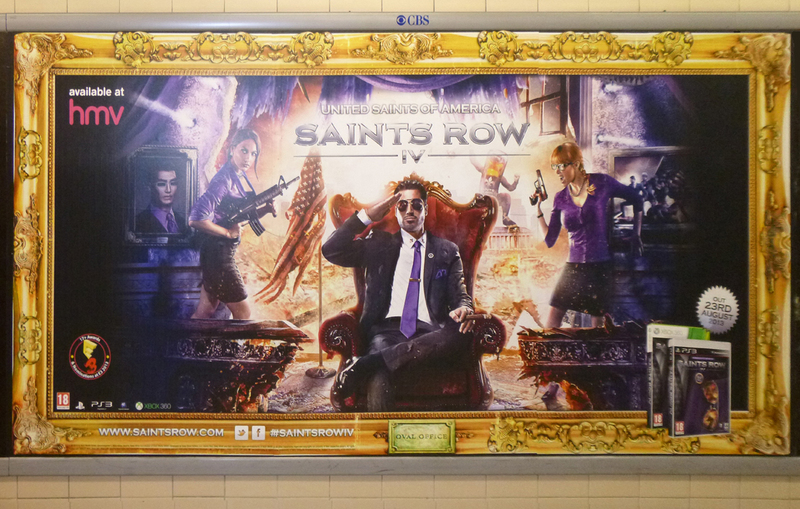 Saints Row IV, advert on London Underground, August 2013. It appeared on the adverts for Saints Row IV, the tongue-in-cheek video game set in a fictional Michigan city, which deals with the rise and rise of a street gang into a sort of international mafia. In the fourth game the leader of the gang has been elected president of the US, and the gilt frame bordering the advert both underlines his status and wryly debunks it. This is not the type of pattern in which one would expect to find a portrait of an American president: a ‘Maratta’ or NeoClassical frame would be more probable – something restrained and linear, with any decorative order arranged in severely parallel lines. It is, rather, a 19th century interpretation of a Rococo frame – perhaps of something like the Dresden gallery pattern, a Rococo design still being made at the Gemäldegalerie, which consists of relatively plain rails with a scotia, and exuberant rocaille cartouches. 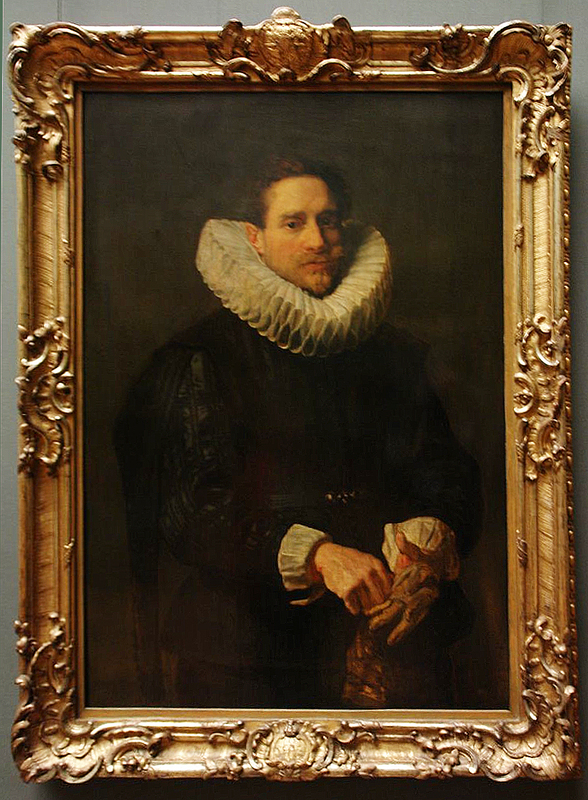 Anthony Van Dyck, Portrait of a gentleman putting on his gloves, Gemäldegalerie, Dresden. 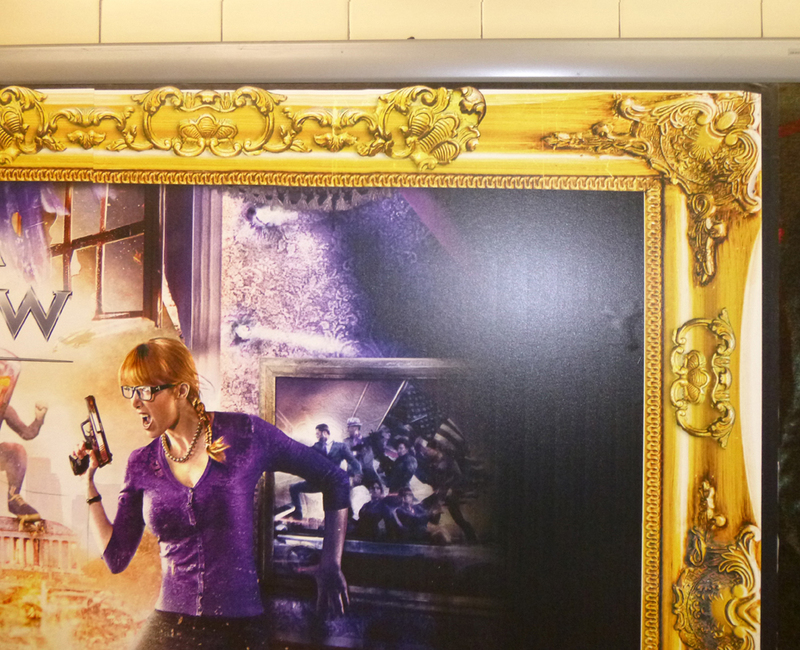 Saints Row IV advert, detail. 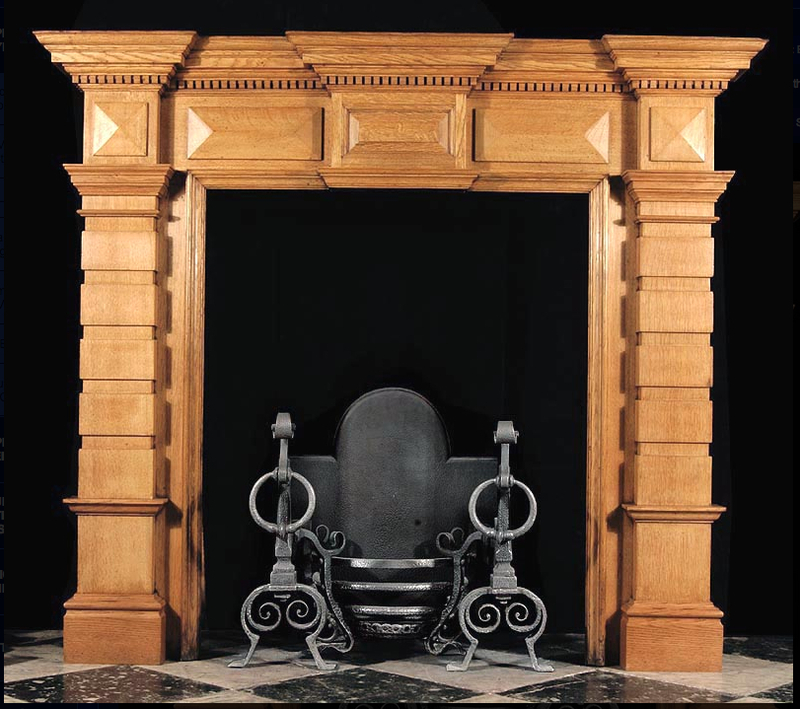 The Saints Row frame has an ogee rather than a scotia section, but the Rococo cartouches (which appear to have alighted on the frame rather than being organically integral to its structure) are very similar; the Dresden frame contains the royal coat of arms on the central cartouche, supported by eagles wings, and the central motif on the Saints Row frame can also be interpreted as eagle’s wings. 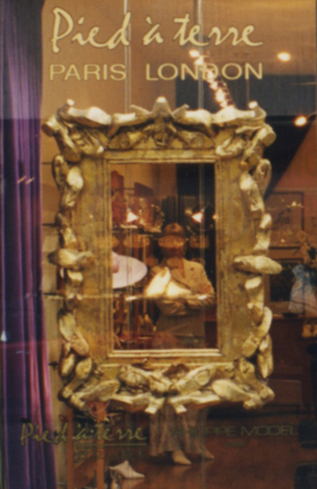 This vast puff of pomposity is quite as clever in its effect as the Prada versions of ‘Medici’ frames; it is visually striking, its vivid yellow gold set against the complementary purples of the picture; its use of cod Rococo ornament plays on the parodic elements of the game; and it also fires an expectation that the product it is promoting is of high quality – the grande luxe edition of a video game. 21st century artists may have moved on from this use of the frame to exalt their work and the subjects they paint, but commerce has rushed in with greedy hands to seize on this particular index of luxury, quality and style. With thanks to all those who have provided images for this article, and especially to Marta Monaco of Prada, the only publicist for a designer brand to respond – and to respond rapidly, courteously and helpfully – to my questions. Marta Monaco, Public Relations Manager, Prada.